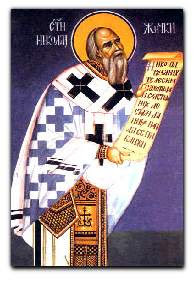 Saint Nikolai of Zhicha, “the Serbian Chrysostom,” was born in Lelich in western Serbia on January 4, 1881. His parents were Dragomir and Katherine Velimirovich, who lived on a farm where they raised a large family. His pious mother was a major influence on his spiritual development, teaching him by word and especially by example. 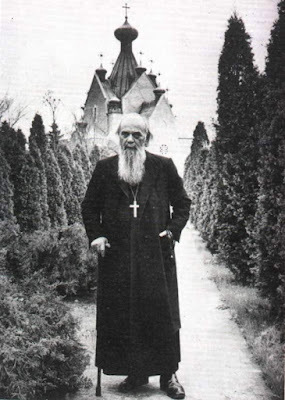 As a small child, Nikolai often walked three miles to the Chelije Monastery with his mother to attend services there. The Communist leader Tito was just coming to power in Yugoslavia, where he persecuted the Church and crushed those who opposed him. Therefore, Bishop Nikolai believed he could serve the Serbian people more effectively by remaining abroad. He went to America in 1946, following a hectic schedule in spite of his health problems which were exacerbated by his time in Dachau. He taught for three years at Saint Sava’s Seminary in Libertyville, Illinoise before he settled at Saint Tikhon’s Monastery in South Canaan, Pennsylvania in 1951. He taught at Saint Tikhon’s and also served as the seminary’s Dean and Rector. He was also a guest lecturer at Saint Vladimir’s Seminary in New York, and at Holy Trinity Monastery in Jordanville, New York. On March 18, 1956 Saint Nikolai fell asleep in the Lord Whom he had served throughout his life. He was found in his room kneeling in an attitude of prayer. Though he was buried at Saint Sava’s Monastery in Libertyville, Illinoise, he had always expressed a desire to be buried in his homeland. In April of 1991 his relics were transferred to the Chetinje Monastery in Lelich. There he was buried next to his friend and disciple Father Justin Popovich (+ 1979). 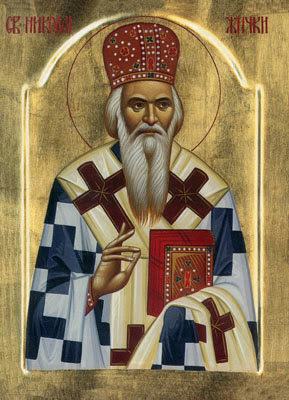 Though he was a native of Serbia, Saint Nikolai has a universal significance for Orthodox Christians in all countries. He was like a candle set upon a candlestick giving light to all (Mt. 5:15). A spiritual guide and teacher with a magnetic personality, he attracted many people to himself. He also loved them, seeing the image of God in each person he met. He had a special love for children, who hastened to receive his blessing whenever they saw him in the street. He was a man of compunctionate prayer, and possessed the gift of tears which purify the soul (Saint John Climacus, Ladder, Step 7). He was a true pastor to his flock protecting them from spiritual wolves, and guiding them on the path to salvation. He has left behind many soul-profiting writings which proclaim the truth of Christ to modern man. In them he exhorts people to love God, and to live a life of virtue and holiness. May we also be found worthy of the Kingdom of Heaven through the prayers of Saint Nikolai, and by the grace of our Lord Jesus Christ, to Whom be glory forever. Amen. O golden-tongued preacher proclaiming the risen Christ, everlasting guide of the cross-bearing Serbian people, resounding harp of the Holy Spirit, and dear to monastics who rejoice in you, pride and boast of the priesthood, teacher of repentance, master for all nations, guide of those in the army of Christ as they pray to God, Holy Nikolai teacher in America and pride of the Serbian people, with all the saints, implore the only Lover of mankind, to grant us peace and joy in his heavenly kingdom! In truth you were revealed to your flock as a rule of faith, an image of humility and a teacher of abstinence; your humility exalted you; your poverty enriched you. Hierarch Father Nikolai, entreat Christ our God, that our souls may be saved. Born at Lelich in Serbia, you served as archpastor at the church of Saint Nahum in Ochrid. You presided on the throne of Saint Sava at Zhicha, teaching the people of God and enlightening them with the Gospel, bringing them to repentance and love for Christ. And for His sake you endured suffering at Dachau. Therefore, Nicholai, we glorify you as one newly well pleasing to God.